Puli Milagai a spicy gravy, Green chilies cooked in tamarind gravy a quite popular Tamil brahmin recipe, side dish for dosai. Generally it is made in our homes for un fermented dosa. We call it as “puliya dosai”. And also it is a best combo for curd rice too. I have never tried pulimilagai at home, when my mom was here last week, she loved the chilies which we get here and wanted to make it. So i just took my camera and just clicked the pictures without taking any effort!!. So here goes the recipe of puli milagai made by my mom. Wash and pat dry the chilies and chop them into fine pieces. Take extract from a small lemon size of tamarind . I used the 2 tsp of read ymade tamarind paste . In a pan add oil and throw in the mustard seeds. When it splutters add the chopped green chilies and saute till it becomes light brown in color. Be careful at this stage. Keep your Kitchen windows open and use the electric chimney in the kitchen. Stay slightly away from the gas stove as the chili may splutter. Keep the flame in medium. When it is is done, slowly add the tamarind extract and add salt, jaggery ,asafoetida and turmeric powder. The addition of jaggery is to balance the spice. Let this mixture boil in a medium flame for 12 to 15 minutes. My mom always makes it in a thin consistency, but if you want it little thick just boil it for few more minutes. Serve with idli | dosa | curd rice. Add little extra jaggery if the chilies are very hot. This can be stored in the refrigerator, in a clean ,dry container for a week.. I love this preparation dearly - So good with thayir sadham!! never heard of this jey. looks great! New recipe to me...looks delicious! ur recipes r tempting.....looks yummy. We make a similar one for pongal n we call it gojju but flavored one.. This is a new thing for me... but I can imagine the flavours and my mouth is watering. Hope to make it next time I make idli. never tried this.. sounds very interesting..
my mouth is watering ..looks delicious!! Oh delicious! Have to make it. Slurp, irresistible puli milagai, never heard about this recipe till now. new to me.. looks very flavorful.. Very yummy delicious..Pulimilagai,looks different !! Looks Hot and YYummYYY !!! I am craving for it Jey, My Great grandma's specialty after she passed away I am still trying to get the same taste!! will try again using ur recipe! Hi Jayshree, Add some ginger to it and it is called 'Puli inji' in Kerla. Ginger gives a nice aroma and lovely flavour to it. 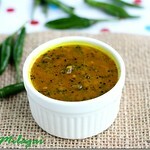 So spicy and tangy, great combo with idlis.. I was reminded of Puli Milagai when my colleague brought the Lucknowi version.Will try this!